Can someone suggest a hotter bulb for my 17" lamp? I currently am using the 40 watt bulb with a standard base. It's a shorter bulb and fits just right. I'd like to try a 50 watt version of it or even something else that could create a bit more heat. I've gone to some hardware stores and it's tough to find higher wattage bulb that are short. I have 5 lamps and this is the newest one...the other lamps are good with the 40 watt bulb but this lamp takes 3 hrs to gt moving while the other ones are good in 90 mins.. The ones I'm using are like these.. Sometimes the frosted 40 watt bulb is a better alternative, especially in vintage lamps. Is this a new lamp or an older (US) model? If you do decide to go with a higher wattage bulb to achieve a faster warm up time, I would advise using with a dimmer. I am going to jump in here and say the 40watt bulbs are indentical to 40watt short oven bulbs. I have never seen a higher watt bulb in that size and I do look when I am out and about. 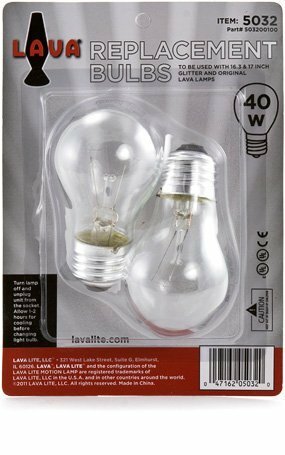 Now, these 40watt short bulbs, at lowes and home depot they carry several lumen versions, some say ceiling fan bulb etc. Try to get one with a higher lumen, which means brighter, which could mean they get a little hotter. So thanks everyone. My lamp is grooving quite nicely bubbles wise. Only thing is the temperature around the base. I used a digital thermometer and the 60 watt bulb (recorded at the metal base of the lamp) is topping out at 157 degrees (after 90 minutes). The other 40 watt bulbs base temp is about 120 degrees. Am I risking an inferno in my apartment? Not risking an inferno, but keep an eye on the wax to make sure it's not getting too hot.